Photo courtesy of Roots Pride. That’s the theme of 2016’s Roots Pride celebration. 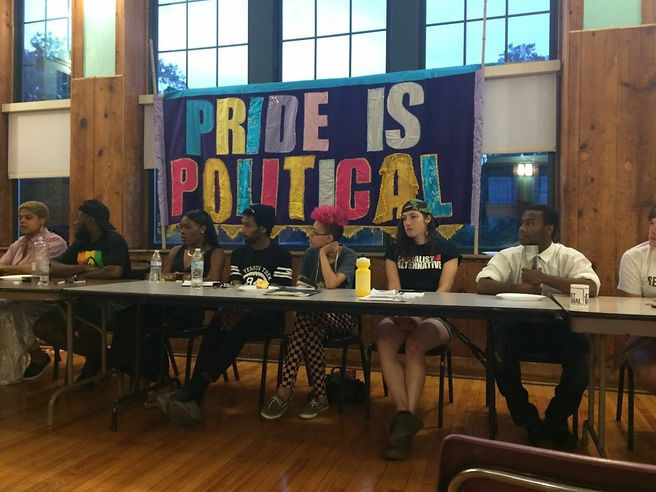 This year, Roots Pride will be asking Pittsburgh’s LGBTQIA+ community members to “envision what #freedomlookslike” – for everybody, not just the white gay men that are often the central focus of Pittsburgh Pride. This year, the Delta Foundation responded by selecting black agender rapper Angel Haze and singer Kesha, who was recently commended by the Human Rights Campaign for her advocacy, to headline this year’s Pride in the Street. Roots Pride founder Joy KMT says that while this is a step in the right direction, Delta still hasn’t done much to support marginalized people within the LGBT community. Joy wants to see people from diverse backgrounds given a seat at the table to help plan Pittsburgh Pride. The Delta Foundation’s Board of Directors, which is almost entirely made up of white men, have repeatedly ignored Roots Pride organizers and other organizations like the Garden of Peace Project, which focuses on queer and trans people of color. Delta has also been criticized for accepting hundreds of thousands of dollars in ticket fees and corporate sponsorships, but using none of that money to support marginalized groups like homeless LGBT youth. This year’s Roots Pride celebration will include a “What Would You Do for Freedom?” town hall meeting on June 6th, a Pop-Up Clinic and Healing Marketplace on June 7th, an under-21 Bayard Rustin Youth Assembly on June 8th, a Roots Pride Rally and Dance Party on June 10th, a BBQ and giant water balloon fight on June 11th, and a prayer walk on June 12th. Event details can be found on the Roots Pride Pittsburgh 2016 Facebook event. All events ASL and wheelchair accessible and free to the public, besides a $5-25 suggested donation for the Pride Rally. Supporters are also encouraged to give as they are able on the Roots Pride Gofundme. Angelica Walker is an intern for The New People covering LGBTQ rights and criminal justice reform. She is a junior at the University of Pittsburgh studying social work, legal studies, writing, and political science.